and Yoga for the Constsruction Industry, based in St. Helena, California, is yoga taught to persons working in the construction industry. 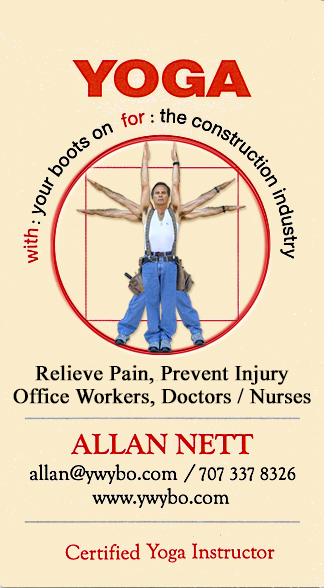 Through body alignment, correct movement, muscular awareness and correct breathing, the emphasis of “job site body awareness and wisdom” is brought to the job on a daily basis. All postures are done in work attire (yes, with your boots on! ), for either office or field personnel. Reduced “out of pocket” medical expenses for minor strains etc. Welcome. I’d like to take this opportunity to introduce you to my Yoga with Your Boots On Practice Videos. These videos are the perfect daily companion to your construction work. Each yoga video was filmed on the job site, which is where you can practice these stretches. Practicing these stretches will help to relieve muscle pains and stiffness in your shoulders, arms, back, ham strings, neck. This introduction is designed to present the different poses in the sequence that follows. Watch all of the videos before practicing any of the poses. After watching all of the videos, choose a particular posture/pose that you believe would help you and follow the directions as best as yo are able, including each small detail. The plum bob 1 and 2 are particularly important. All the poses and benefits are based on an understanding of the Plumb Bob and its actions. All future advanced poses will use these fundamentals to build upon.